"Century 19: History Lesson (Part 2)"
As Lara watches her great-grandfather break the time barrier Batman notices a hypersonic signal coming from directly below them. They burrow into the ground and come upon a chamber carved from the native rock. After discussing the fact that they are below even the tallest buildings Lara notices a metallic coffin. Lara rips the cover off and the two are shocked to discover Superman, who is glad they found him. Lara and Batman wonder how he could be there when they just saw him leaving for the future. Superman explains that he discovered that traveling that way was not an option and neither was a conventional trip to the present. He goes on to tell them that when he hit the time barrier he hit some turbulence, which threw him out of the time warp and sent him back to Earth. After a hard landing Superman climbed out of the crater he created and discovered that he was near Smallville. It wasn't the Smallville of the present, though, but the Smallville half a century before his rocketship arrived from Krypton. Superman makes his way into town and after putting on his old Clark Kent clothes and covering them with some dirt so no one would notice how out of place they would be he made his way to the local sheriff to avoid having the authorities checking out the stranger in town. When he opens the door Superman is surprised again to discover that the sheriff is none other than the New God Scott Free, also known as Mister Miracle. Scott doesn't recognize him, but Metron steps out of the back and informs Scott that this is Kal-El of Krypton and that in eighty years he will be known as Superman. He then asks Superman for the item the Last Son of Krypton has for him. Superman is taken aback, knowing that Metron asked him that for another seven hundred years. Scott tells him that it's better not to ask too many questions. Before they can discuss the matter further Scott's prisoner rises and demands to be released. Scott does so after the prisoner, whose name is Jonny, admits that he has cooled down enough. As Jonny leaves he and Superman lock eyes. Jonny asks if he knows Superman, who replies that he doesn't think so. As Scott and Superman watch him walk away Superman comments that he is surprised Scott let the kid go with his guns considering how angry the kid is. Scott tells him that even prairie dogs carry guns in this part of the world. Metron interrupts their debate by asking Superman what he is doing there. Superman starts by telling them to call him Clark and by asking to hear their story first since Mister Miracle didn't make his debut until a hundred years from now. Metron tells him that all he needs to know is that Scott Free escaped from Apokolips about sixty-five years before and that they have been wandering the Earth ever since. Meanwhile Jonny Kent makes his way to the Slade and Stool while a young, blond haired girl he calls Em tries to stop him. She tries to convince him not to face the man Jonny aims to kill. Jonny tells her that he will be fine and that the man in question is older and probably slower now. Em pleads with him and admits that despite the fact that they have only known each other for six days that she knows that Jonny is the man she wants to spend the rest of her life with and the father of her children. Inside the Slade and Stool Jonah Hex finishes his meal when Jonny enters. Jonny calls the man out to avenge the deaths of fourteen men that Hex killed. Hex tells him to run along and turns, but Jonny grabs him, demanding that he face Jonny like a man. Outside Superman, Scott Free and Metron make their way down the street discussing Jonah Hex when they see Jonny being thrown from the Slade and Stool. Free pounces on Jonny and holds him back while Jonny screams to be let go. Hex tells Free to go ahead and let him up if the boy is so eager to die. Superman steps between them and tells Hex that he doesn't think so. Hex says that he has no quarrel with him and that he would be smart to keep it that way. Scott Free agrees and decrees that Hex and Jonny will settle this the next day at high noon. Scott then takes Jonny back to jail to keep him out of trouble. Em walks up to Superman and tells him that he is going to have a hard time talking Jonny out of fighting, but thanks him for stepping in. Superman introduces himself as Clark Kent, which shocks Em. She asks if this is some kind of joke since Jonny's name is Kent and her name is Martha Clark. Back at the station Metron informs Superman that he has already deduced this relationship. Superman agrees, saying that while he is not a big believer in fate but it would seem that something guided him to this moment. Scott asks if he intends to interfere, but Superman doesn't know. Metron tells him that he must do nothing. Superman is curious, wondering if he did something wouldn't it automatically be part of what already happened. Metron replies that he shouldn't be so sure. Since Superman's arrival Metron has been running scans with his Mobius Chair and from those scans he has determined that there is an unnatural flux in the fabric of space and time. It was that which hurled him to the past when he wanted to go to the future. 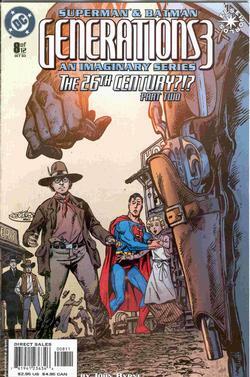 Superman reluctantly accepts the explanation and turns the subject towards Jonah Hex and what he is doing in Smallville. Scott Free explains that Hex has come to town to collect a bounty on a killer named Caleb Lamb. Superman works out that Hex came to town for Lamb and Pa Kent came to town for Hex and Martha was already there since her family was one of the founding families of Smallville. The next day Superman tells Metron that he doesn't like this and that while every instinct says that Pa will survive there is still a nagging doubt about that it happened because of something he did and that maybe it is why he is there. Scott tells him that he should trust Metron, who hasn't steered him wrong for fifty years. Metron and Jonny join them with Metron saying that it is time. Scott hands Jonny his shooting iron, telling him that Metron looked it over and that while it's nothing fancy it won't jam on him. Jonny thanks him and walks off to his fate. Superman steps forward to do something, but Metron and Scott stop him saying that no matter what happens time must be allowed to unfold as it will. In the town square Hex and Jonny square off. Hex asks him if he is ready to meet his maker. Jonny replies that he is more ready than Hex will ever be. They draw and Hex shoots Kent's gun out of his hand. He walks over and tells Kent that he was fast, but not fast enough. Hex kicks him to the ground and points his weapon between Kent's eyes. Kent shouts for him to go ahead and kill him, but Hex simply breaks Kent's glasses with his gun. Hex walks away, saying it's not worth it. He adds that when he killed Jonny's near and dear he was a soldier fighting for his country and that now all he kills for his money. Suddenly a shot rings out grazing Hex's sleeve. He turns to see Caleb Lamb standing there shouting that he heard Hex was looking for him. Hex draws his weapon and kills Caleb, telling him that he won't get a second chance at him. Scott orders Hex to hold it. Hex counters that it was a righteous kill and that everyone saw. Before he can go on, Scott and Superman see Jonny holding the wounded form of Martha Clark, his eyes begging for help. Superman and crew were able to get her to the town doctor, but he was barely more than a veterinarian. Superman wants to do something, but Metron tells him that nothing can be done by his hand. Superman demands that Metron do something about it since his Mobius Chair can fly to anywhere in the Universe. Metron agrees and flies to Metropolis to fetch a doctor named Collier. Collier is able to save her, but when he's finished he informs them that while she will live there was a lot of damage to the soft tissue of her lower abdomen, which means she will probably never be able to have children. Inside Martha's room she wakes to find Jonny watching over her. He tells her to keep quiet and that she is going to be fine. She tells him that she doesn't remember what happened. Jonny tells her that it's all over and that they never need to ever speak of it again. He also tells her that she needs to get her strength up because as soon as she's on her feet they have an appointment with the preacher. Later, Metron informs Superman that they should address the problem of returning him to his own time. Superman is confused and wonders if he attempts to fly to the twenty-sixth century will be only be hurled further into the past. Metron agrees and tells him that he might have an idea that will work assuming that he has access to the kind of technology he might have. They created the chamber and the suspended animation capsule Lara and Batman found him in. Lara wonders how he could have been buried there for seven hundred years without anyone finding him. Superman explains to her that that's the hardest part to figure out because according to Metron he wasn't there for seven hundred years. Elsewhere Granny Goodness tells Desaad that what Darkseid has planned defies the laws of nature and science. Desaad asks her what are nature and science to a God. Darkseid summons them to look upon his work, but Granny admits that it is beyond her comprehension and asks for an explanation. Darkseid explains that what they are looking at is a Helix. It is a temporal corkscrew that will twist the fabric of time and space to his ends. In this manner defeat will be turned to victory by attacking his enemies at moments ever deeper into the past when their defenses will be weaker. Granny admits that she doesn't understand. Does he expect to lose to the enemy? Darkseid replies that he never expects defeat, but that has always been his greatest weakness in the past. With the Helix his shock troops can abandon the field of defeat and move back a full century before the assault when their foes will anticipate the attack. Desaad pleads for forgiveness by seeming to question him, but if this time jump is used more than once won't the enemy remember what will be for them an event in their own past. Darkseid replies no because the nature of the Helix is that its effects are cumulative. Though his troops will move into the past, that past will not exist until they create it. Granny asks if that means that an attack on Earth in the twenty-fourth century will not be remembered by humans in the twenty-fifth century because the attack on the twenty-fourth will not have happened. Darkseid responds yes and that now is the time for the next step in their plan, which is the creation of an army suitable for carrying out these assaults. An army of Parademons with the gift on independent thought. The only problem with guessing the artist's intent, besides the realization that you might be really wrong about the whole thing, is reconciling that intent with your own feelings on the work. Try as I may I can't really hate a comic that I once despised after finding out what the writer or artist was going for. On the flip side I have sometimes gone in knowing the intent and had that completely cloud my vision to the point where I end up hating the book. So either way its kind of a crap shoot when I start breaking down the comics I read for review. Which is a really long winded and somewhat pretentious way of saying that as much as I liked the eighth installment of Generations III I also had some serious problems with the way the series is playing itself out. It comes down to what Byrne is trying to do with the series. Some writers prefer to focus on plot while others like to focus on the characters. I am character man myself, preferring to read about the people in the book rather than the high concept that the book is supposedly about. The problem I'm having is that Byrne has developed a pretty complicated plot, but seems (and I stress the word seems because I could be way off base here) to be forgetting about this to play in the sandbox he created. The plot seems (there's that word again) to be relegated to the last two pages of the book while the rest of the story is about expanding the Generations universe. This is where the creator's intent comes into play. If this was Byrne's intent from the beginning, then I have no problem with what he did in this issue. It was a really solid story that had the "now it can be told" behind the music feel that Byrne does so well. (Except in the case of the ill fated Genesis event.) We learn how Ma and Pa Kent met in this universe and why they could not bear children. We also get a nice little western tale, just as two issues before we got the whole romance comic riff. Smallville was portrayed as a rough little town where killers and bounty hunters came in addition to young men with blood oaths of vengeance to fill. A nice comic that was enjoyable to read. If Byrne's intent was to continue his plot, though, then I think he could have done a much better job. The argument could be made that the very fact that Scott Free and Metron were on Earth in the 1800's could be a symptom of what Darkseid has planned for the Universe, but then again it could be just another untold tale of the New Gods. The one thing I did like was the fact that Darkseid's plan was finally explained. It gave me a headache, as many time travel stories do, but there was an explanation nonetheless and I was pretty happy with it. I'm interested in how this whole thing is going to play out, which is the exact feeling a comic should give a reader. The thing is that I think that by issue eight the plot should start to pick up a little more. As much as I enjoyed the story I also was a little ticked that once again I pick up an issue of this series and the main plot, which to me drove the first issue, was kind of shuffled to the background again. So my problem is trying to guess Byrne's intent with the series. If his desire is to tell great, character driven stories of the Generations world, as he has done in the past, then he succeeded. The characterization was consistent and transcended their four color reality. If his desire was to tell a cosmic epic about the evil machinations of the vile Darkseid, than he should either get to it. Again the argument could be made that he has been telling the story all along with the Parademon attacks and such leading up to the epic climax. That's fine, but there comes a time where subtly should end and some kind of revelation made. Twelve issues is a long time to tell one story. My hope is that the first four issues where the set-up, the second four were an attempt to have you care about the main players (or at least the surviving ones) and that the last four will bring the whole thing together. I look forward to see what happens, but not with the zeal and gusto that I previously had. Overall the artwork was solid and effective. This is some of Byrne's best work on the series and I enjoyed the contrast to the futuristic scope the series has had so far. Cover Art - 5: Byrne put a lot into this cover, which really made it shine. Jonah Hex's gun in the foreground had some nice detail and shadowing to it, which was highlighted by the high noon sun effect. The presence of Superman on the cover seems out of place, but really grabs your attention. Without him it would have been a really nice western cover. By having him on the cover the feeling that things are not what they appear (which mirrored Superman's reactions to coming upon his adoptive parents before they were married) really shines through. While this wasn't my favorite cover it was one of the better ones of the series.